$24.99 to $44.99 & FREE Shipping on orders over $59 $35. Manifolds are a great way to have one CO2 tank supply multiple kegs. 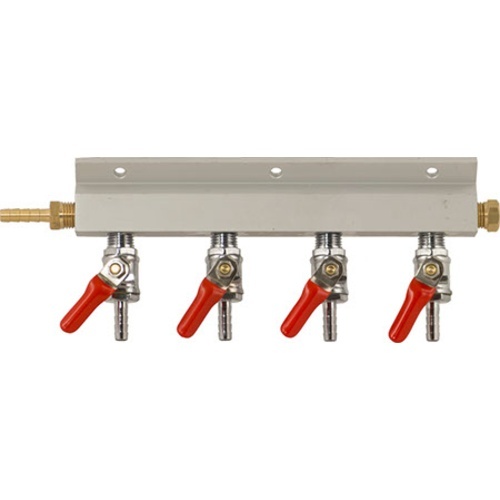 This manifold is made from aluminum, brass, and stainless. 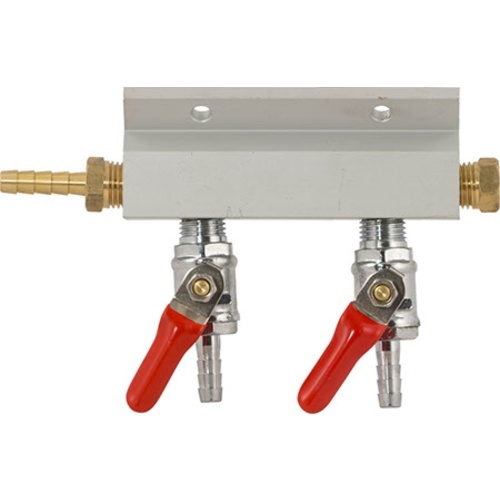 It also works up to 100 psi and includes 1/4 in ball valves with built in check valves. Another ball valve can be added to the end of the manifold for an additional gas line. I have 6 kegs, and I like being able to select which ones get gas. what diameter hose is used on this? BEST ANSWER: As the 1/4" in the description implies, all hose barbs on the block and valves are 1/4" to fit 1/4" ID hose. I would imagine you could use 3/16" hose, but the smaller tubing would go on very tight and would probably need to be heated in hot water just to slide on properly. The 5/16" hose is going to be loose, but a good hose clamp should synch it down to the barb. 1/4'' gas line fits, but 3/16'' will also fit if it is warmed with hot water first(makes it flexible/soft). I've used 1/4 and 3/8. You'll need to clamp it tight, but it works like a charm. I am using it on a King Keg keggerator. I think they say it is 5mm. you would use 1/4" ID hose for this manifold. What size are threads on the barbs? BEST ANSWER: I don't have any way to tell for sure and there is a slight chance it could metric, but they appear to be 1/4" NPT. Threads on the barbs, or size of line the barbs fit into? What are the dimensions of the 2 way manifold depth height and length? BEST ANSWER: Hi Richard - Length is ~5 1/2", Height ~3 7/8". It should be known, the mounting bracket is angled, so when mounted it will have an approximate width of 3 1/4". Is this good for nitrogen? BEST ANSWER: I've used it for nitro and it works without any issues. I have a one tap kegerator and wanted to expand to three. Easiest way way to expand with two picnic taps. Works like a charm no leaks. Very happy. Manifold was well made. the hose barbs were a bit small for my hose and I had CO2 leaks until I cranked really hard on the the hose clamps. Make sure you use the correctly sized hose clamp tightened with a screw driver. A bigger OD hose barb would have worked better. Exactly what I needed! Worked like a champ! Why do they make it so hard to remove the adapters I almost broke see aluminum plate before the adapter broke Free Teflon tape is better than whatever they are using for glue till the threads together. Manifold was as expected no leaks and works as advertised. Just what I needed for my two-line Keg King. It should have been included with the Keg King, but was a quick and high quality fix. 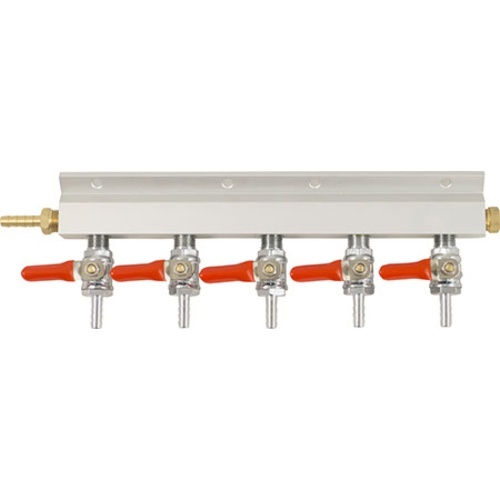 I purchased a 4 way manifold at the same time as 4 gas lines to complete my carbonation setup. I was disappointed to find that the outlet barbs are 1/4" and the houses are 5/16". It is nearly impossible to get a gas tight seal with this combo. I used the hose clamp came with the hose set and added aoetiger clamp I addition. It is still minimal as the hose rotates easily and it would follow that there is some leakage. Great product. Perfect for my keezer. Absolutely perfect. I connected this to my CO2 tank after verifying there were no leaks on my gas line and regulator. I then bumped the regulator up to 40psi and allowed gas flow to the manifold for 48hrs with the CO2 tank main valve in the off position. No leaks. 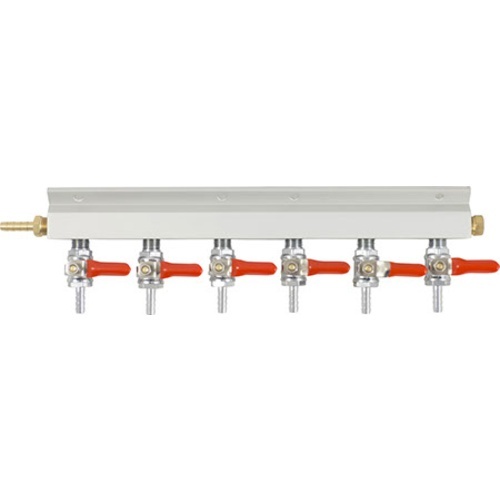 This manifold (the 4 port) is at a slight bevel to allow for the perfect mounting angle in a keezer. Great product. I would buy it again if it ever got stolen or decided to leave me. Works great, and it should have been included with the Keg-King Triple Tap Kegerator! Very well made and affordable. Hooked it right up and not a single leak. Thank you Morebeer!